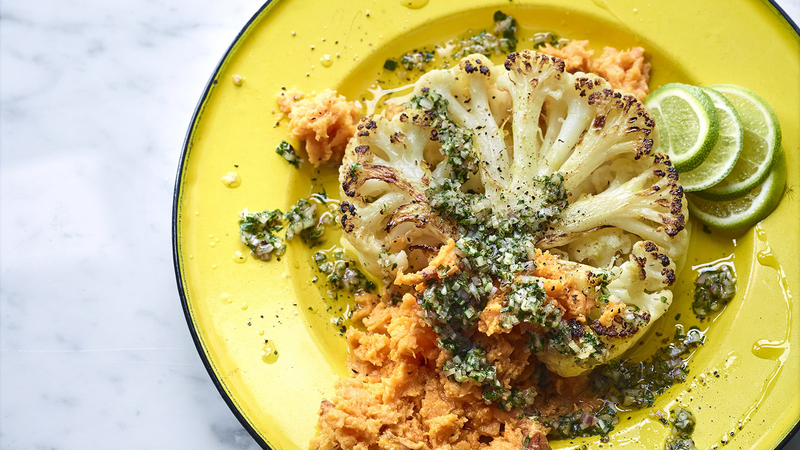 Make Joe Wicks’s vegan cauliflower steak with cheat's chimichurri, a delicious dinner set to impress vegans and non-vegans alike. Cut the sweet potato into smallish cubes. Place in a microwaveable bowl with the lime wedges, cover with cling film, then zap on high for 10 minutes until completely cooked. While the sweet potato is cooking, place the cauliflower steak in a lidded frying pan. Pour in 50ml water and put the lid on, then cook over a high heat for 7 minutes until all the water has evaporated. Meanwhile, make the cheat’s chimichurri sauce by crushing the garlic clove into 1 1⁄2 tablespoons of the olive oil. Mix in the shallot, parsley and dried oregano. Stir, then add salt, pepper and the red wine vinegar to taste. Come back to the cauliflower. Take off the lid and flip the cauliflower steak. Pour in the remaining olive oil. Season and cook without the lid for 5 minutes. Remove the lime wedges from the cooked sweet potato, squeezing out any juice. Season with salt and pepper, then mash in the bowl with a fork. Spoon onto a plate. Top with the cauliflower steak, browned side up, and drizzle over the chimichurri sauce. Whether you’re a full-time veggie or just looking to reduce the amount of meat you eat, Joe Wicks’s Veggie Lean in 15 is full of delicious but healthy vegetarian and vegan recipes to help you get in shape - all of which take just 15 minutes to prepare.